View Recipes : PepperTraders.com, West Texas Pepper Traders, Inc. Here's a list of all the recipes that have been submitted by our customers. This recipe gets rave reviews every time I serve it. Its even better with the Bread and Butter Jalapenos. I created this fabulous recipe for adding to any thing that goes good with Bean dip. queso, nachos, eggs, dip with chips, etc. Easy to assemble ahead and freeze. This is a great dish if you're serving a lot of people on a budget. When I added the B&B jalape�os it became the most requested! This peanut butter also makes great cookies. Just substitute for plain peanut butter in your recipe. A great variation on home made guac! "Whats' in here that's soooo good?" Another great dip. Wonderful for parties, special occasions, or an everyday snack. This is easy, all in one bowl to mix and then to the pan. It is awesome for meatloaf! Peppers Rockefeller - "WTPT Jalapeno Roaster Recipe"
Basic Stuffed Jalapeno - "WTPT Jalapeno Roaster Recipe"
Cole Slaw with a KICK! Need something to take to that summer picnic? Bread and Butter Jalapenos take plain ol' cole slaw to another level! My mother used to make this with just the potato and onion. This is one of those rare occasions her recipe could be improved. You can get this one made for you at the Shoppin' Basket deli counter in Ballinger, TX. Submitted by Lynda C.
Submitted anonymously. We've tried it and it's great! Thank you, whoever you are. "This was first made during a product demo we were doing in a local grocery store. It is very tasty!" "Don't throw that juice away. It is quite possibly the best marinade you will ever find. It's so good we started bottling it up as a separate product. The Original Bread 'N' Butter Marinade"
West Texas Pepper Traders' "Secret Recipe Cornbread"
Well it's not very secret now, is it? Not like your grandma used to make! 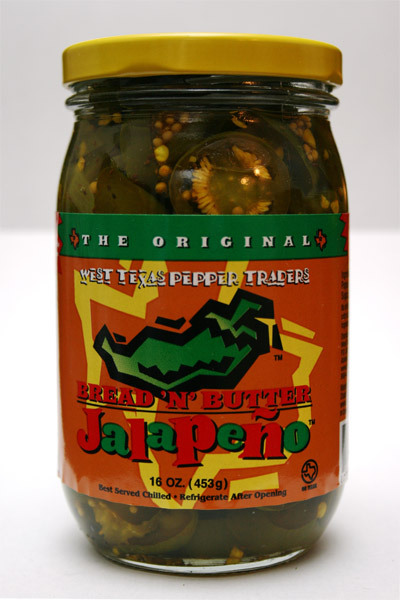 The Original Bread 'N' Butter Jalapeno "Quick Party Dip"
Fast and easy, always the hit of the party!